Valu are superb value for money reels. 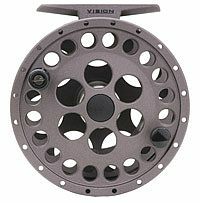 Their styling is of Vision's famous GT reel, just fattened up. They are machined die cast reels with a sealed, smooth, drag system consisting of stainless steel and carbon discs. Drag strength is altered via an easy adjustable colour coded drag knob. With a generous spool size to hold as much line backing as would be required for #3 to #8 weight lines.